The violin, made by Michele Angelo Bergonzi circa 1750s, has been used as Josefowicz’s concert instrument for the past 12 years, during which time she has played with many of the world’s most prestigious orchestras and conductors. It is estimated to bring between £100,000 and £150,000 ($159,825-239,738). Michele Angelo Bergonzi was one of the leading makers of his day. He worked in Cremona, home of the Stradivari and Guarneri families, and his father, Carlo, worked in the Stradivari workshop towards the end of the illustrious maker’s life, suggesting that he may well have known Antonio Stradivari. Also included in the sale will be further violins by Carlo Bergonzi and Francesco Rugeri, as well as a viola by Lorenzo Storioni and a cello by David Techhler. Canadian Leila Josefowicz is well known for playing contemporary music. She has recently been awarded a MacArthur Foundation Fellowship in recognition of her commitment and passion for music. In July, a 1696 Stradivarius violin that was stolen from acclaimed Korean musician Min-Jin Kym was found at a property in the UK. The “Lady Blunt” Stradivarius sold for a record £9.8m ($15.6m) in June 2011, raising money for victims of the Japanese earthquake and tsunami. Made in 1721, it is one of the two best-preserved examples of Antonio Stradivari’s astonishing workmanship. 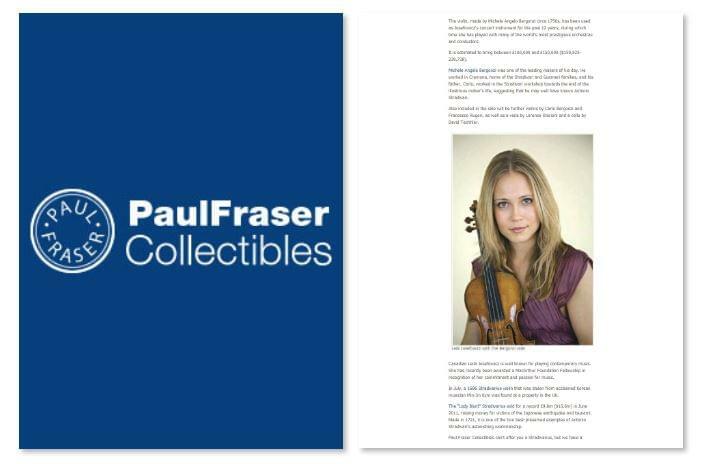 Paul Fraser Collectibles can’t offer you a Stradivarius, but we have a fantastic selection of music memorabilia for sale.